If you own a Bellman Visit receiver unit, you likely put your faith in the product's ability to perform, trusting that it will always be there to alert you when you need it. Keeping your device charged is therefore a priority: failure to do so puts you at risk of missing your alerts, whether this is an incoming call, or something more urgent like the sounding of your fire alarm. The Bellman Visit Charger is a sturdy and durable charger which can connect two vibrating pads at once, so you can sleep easy knowing your device will always be ready to alert you, even when charging at night. How Does the Bellman Visit Charger Work? 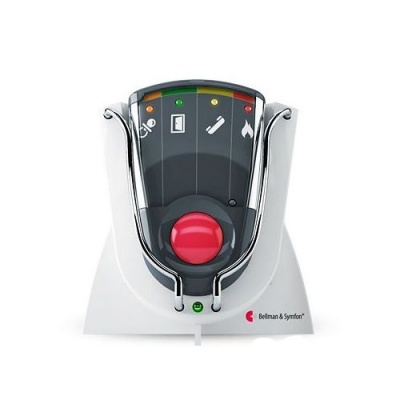 Simply slot your existing Bellman Visit Pager into the machine, allowing it to charge. A full recharge generally takes up to eight hours so connecting it at nighttime is suggested, meaning when you wake in the morning your receiver will be as ready for the day ahead as you are. You can trust that your receiver will continue to pick up signals whilst it is charging and provide you with the necessary alerts. The charger itself will vibrate and light up when the receiver is notified. Alternatively, you can plug in up to two Bellman Bed Shakers to attract your attention when using whilst sleeping. The Bellman Charger plugs into the mains, but also includes back-up batteries which automatically charge and take over if there is a loss of power. That way, your machine will always be ready to perform. To get the most out of your Bellman Visit Charger, ensure it has charged for 24 hours either when first used or when the internal back-up batteries have run down. When possible, always keep the charger connected to the main power supply so that the back-up batteries are automatically charged. Only use rechargeable NiMh batteries in the Bellman Visit Charger - non-rechargeable batteries can leak if re-charged, which will damage the electronics of the product. The charger is for indoor use only. Please note that Bellman Visit Pagers are available separately.